Who is allowed to take part in the ballroom/latin tournament? All dancers from student/university dance teams, dancing schools, or any other kind of dance sport groups. Dancers who have or had a tournament license for German C-class (or aquivalent) are not allowed to participate. However, dancers who only have or had a tournament license (Startbuch) in one section (e.g. ballroom) and have never danced higher than C-class (or equivalent) are allowed to take part in the other section (i.e. latin, and vice versa). 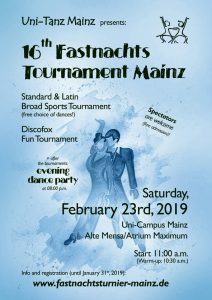 Participation fee is 10 € per couple (regardless of the number of registered dances). Registration deadline is February 8th, 2019. There will be an additional deposit of 5 € for the starting numbers that will be returned in the evening. It is not possible to pay the deposit in advance. We also offer a (gym) sleeping hall space for free and breakfast for approx. 10 € per person. In order to facilitate the organization, we kindly ask you to transfer the registration fee within one week after registration. (Transaction details will follow via e-mail after registration.) Registration is only completed after the fee has been transferred. Any transfers not arriving on time will be sanctioned with an additional fee of 5 € . Cancellations must be made before February 8th, 2019, otherwise the registration fee cannot be returned.